Test your knowledge of how Jesus appears in the Exodus. Not so much prophecy, but His name does appear and there is a lot of typology and teaching references plus of course a lot of God in visible form. Of course the big themes in Exodus that model Jesus are the Passover and the Tabernacle… but there are a lot of small connections too. Answer the questions as best you can, the answers will be given as you take the quiz, and whether you are right or wrong you’ll find out a bit more with the score than you got in the original question. When you are done you’ll see your score broken by the categories I use to report the Old Testament. Hope you enjoyed the quiz and maybe learned something or had you interest piqued. Please share your score and the quiz with your friends … and don’t forget to check out some of the resources and posts. Exodus 12 refers to Passing over of the Angel of Death as the culmination of a judgement against “all the god’s of Egypt” just as the New Testament presents Jesus’ ultimate Passover as a victory over every demonic power! So the first three questions concern this season of spiritual warfare, the plagues of Egypt. So to get your brain in gear can you put the plagues of Egypt in order? Ok no problem, take your time… the next question has a lot more points available to it. Now you’ve had to think about the plagues let see if we make the connection between the plagues and the attributes of Egypt’s gods. Every plague contains points of contact with at least one senior and/or minor gods in Egypt’s pantheon. See if you can match an Egytian demiurge to each plague. Drag the image to the plague! Great lateral and literal thinking. 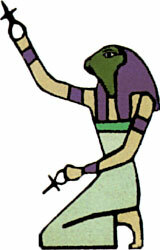 Hapi was once the name of the Nile, the gnats came out of Geb the earth, Heket had a frog’s head, Khepri was chief of the “insect God’s and had a beetle for a head, and Hathor and Apis where cows. OK there are more to come… so going forward make sure you make use of the linked information on each god, look at the pictures carefully and read the descriptions that appear when you hover over the image! Hover over images for help! click them if that’s not enough! Now try to match the last five plagues to a relevant pagan deity! “And so it says: ‘When He(Christ) ascended on high, he led captive a host of captives'” – Ephesians 4:8 quoting Psalm 68:18. The burning bush, Exodus 3-4 is the first Christophany (God/Christ appearing in tangible form) in the book. It takes up a whole two chapters, and the Greek version of the OT, the Septuagint, uses the word “apostle” 7 times in it. It is part of the ministry of Christ to send apostles! For more click here! Now, what is the name of the location that Moses has this commissioning encounter? Burn baby burn! Quiz-go inferno! There are parallels between Moses’ apostle-ing by the visible LORD in the burning bush and the apostle-ing of various groups in the Gospels. Which of the following promises or commissions from the New Testament is Moses not given at his own apostle-ing, either explicitly or cryptically? To be with them (Matthew 28:20). To be a witness of the Cross (Luke 24:46-48). To pick up serpents (Mark 16:18). To cleanse leprosy (Matthew 10:8). To teach give words to the apostle/disciple when bought before rulers and kings (Matthew 10:18-19). To drink poison with no effect (Mark 16:18). Cushty! Oh and the one about being “a witness to the Cross”, the word “Sign” is used several times through Exodus 3 and 4 normally written with three letters, אות, that in the pictographic form used in Moses’ day showed a bull, a nail and a cross. Bulls represented the largest possible sacrifice and even in Jewish culture where considered to imply God! This one is a bit sneaky I’m afraid. Get it right and I will tell you more! Moses’ commissioning also introduces the word “Holy” to the Bible for the first time… Exodus 3:5. Then the very next verse is quoted by Jesus in response to a question intended to catch him out … what was Jesus being questioned about when he referenced Exodus 3:6. Smart answers to tricky questions don’t come too easy! In preparing the children of Israel for the great escape of Passover, YHWH makes four promises in Exodus6:6-7. These promises became part of the Passover ritual and were celebrated by Jesus at the last supper. They where symbolised by which of the following Passover tokens? A wafer of unleavened bread. A piece of bread dipped in cooked Lamb juices. Psalm 116, sung as a hymn at every Passover meal, actually refers to this cup as “the cup of Salvation” or in Hebrew “the cup of yeshua/Jesus”. YHWH reveals a bit more of his promissory nature for the first time since Abraham shortly after the Israelites cross the Red Sea. He shows the people a healing tree and declares himself to be YHWH Rophe, The Lord Who Heals You. What was the name of the place where this happened? “Marah” means “bitterness” it is the root of the name “Mary”. None of these places is too far away… except Memphis… which is apparently where Elvis lived …. in Egypt. In Exodus 17 Joshua, who is called “Jesus” in the Greek version of the Old Testament (The Septuagint, LXX), fight’s a typologically symbolic battle, overcoming the flesh represented by the Amalekites (who where descendents of Edom who stand for Adam in prophecy) while being watched over by the Law represented by Moses and the sacrificial system represented by Aaron the High Priest. Immediately after the battle Moses builds an altar and a new YHWH name is revealed. “YHWH is my Banner”, Exodus 17:15 pre-empts “God who gives us the victory through Jesus Christ” 1 Corinthians 15:57. Hey, as famous poet Bill Wobblyjavelin once said, “what’s in a name?” anyway! In the Sermon on the mount, Matthew 5-7, Jesus radically re-interprets the Ten Commandments, (also given on a mountain). Some directly and others conceptually. So which of the following Commandments from Exodus 20 are referenced in the Sermon on the Mount by direct quote rather than oblique reference? Tick all that apply. “You shall have no other god’s before me” . “Remember the Sabbath and keep it Holy”. “You shall not commit adultery”. “You shall not bear false witness” . “You shall not commit murder”. “You shall not covet your neighbour's stuff”. “You shall not take the name of the Lord in emptily”. The phrase “the blood of the Covenant” is only used once in the Old Testament but is used six times in the New Testament, (sometimes it is expanded i.e. “the blood of the New Covenant” or “eternal Covenant”). Anyway this blood is sprinkled on people who then get to “see” God complete with hands and feet, and then get to eat and drink in his presence. Which of the following do we know for sure got to experience this blessing? Abihu who offered up "strange fire". So pretty much everyone then! It was more than you might think! Which item found in the Tabernacle is referenced by Paul in Romans 3:25 as “in His blood through faith!”? The bronze laver – used for washing. The altar for the burnt offering - that allowed access to the Holy Place. The altar for incense - that represented intercession. The lampstand - that promised light. The mercy seat - where Jesus would sit in the clouds of heaven. The Greek word translated as “propitiation” is the noun used to translate the word(s) “mercy seat” in the Greek Old Testament, the Septuagint LXX. 🙁 It’s all over now!